Photograph taken by Fritz Kapp in 1904 in Dacca (now Dhaka), part of an album of 30 prints from the Curzon Collection. 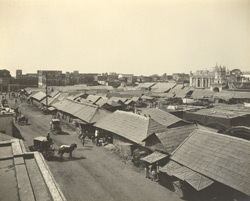 This is a view of the Chowk or the market place in Dhaka, looking across the shop roofs. The Chowk Bazaar is at the seething heart of the old city of Dhaka, its narrow, twisted roads are lined with old buildings, the ground floors of which house shops selling a multitude of things. All manner of vehicles, predominantly rickshaws, crowd the streets. Lord Curzon was Viceroy of India from 1899-1905. In February 1904, he toured Eastern Bengal and visited Dhaka on the 18th and 19th where he stayed at the Ahsan Manzil Palace. This album of gelatine-silver prints commemorates his Dhaka visit, though it is not a record of it and only presents us with general views. Kapp worked as a commercial photographer from the 1880s onwards and had studios in Chowringhee Road and Humayun Place in Calcutta. From the early 1900s he had a studio in Wise Ghat Road in Dhaka. Dhaka, now the capital of Bangladesh, became prominent in the 17th century as a provincial capital of the Mughal empire, and was a major centre of trade, particularly in fine muslins. Its history, though largely obscured, is ancient, and it was brought under Islamic rule by the 13th century, first by the Delhi Sultanate then by the independent sultans of Bengal, after which it was taken by the Mughals in 1608. In the 18th century Dhaka was eclipsed by Murshidabad under the Nawabs of Bengal and its population diminished. As the fortunes of the Nawabs declined, the power of the East India Company became a new factor. Queen Victoria’s Proclamation in 1858 brought all the territories held by the Company (including Dhaka) under British rule.